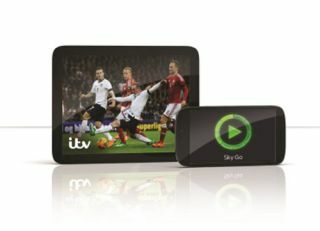 ITV channels now available to Sky Go customers | What Hi-Fi? UK regulations might prevent Sky from broadcasting live coverage of the World Cup, but users of its Sky Go service have just been handed a major bonus in time for the big kick-off on 12th June. The pay-TV provider has announced that ITV channels – including ITV and ITV4, which will show live action from Brazil – have now been added to Sky Go's line-up for the first time. ITV is one of two broadcasters that hold the UK broadcasting rights (the other being the BBC) to the 2014 FIFA World Cup and the addition of its channels to the Sky Go line-up comes into effect today [4th June]. That means you will be able to watch two of England's group games through Sky Go, as well as the other fixtures being screened by the independent broadcaster. But it's not all about football. If football dominates the main TV in your household this summer, you can retreat to another room in the house and watch ITV favourites such as Coronation Street through the mobile service. Meanwhile, ITV's new Encore drama channel will join Sky Go after launching on 9th June and an extensive library of on-demand drama content from ITV will also be available. Sky brand director of TV products Luke Bradley-Jones said: "Whether people want to catch the football – or take refuge from it – this gives our customers even more flexibility to enjoy the TV they love, on their terms." ITV director of pay and distribution Martin Goswami added: "Allowing viewers to access our shows across a range of platforms and devices, both at home and on the move, is a key part of our strategy."